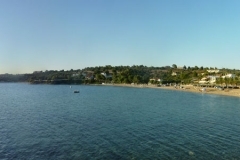 A not well-known beach of Sithonia, located between Nikiti and Ai Yiannis. It has two small bays that end in a cape with its characteristic rocky island. The water is clean and shallow while the sea bottom is sandy. It is easily accessible by car, although you should first locate the narrow road that leads to the beach. There are not any facilities on the beach, so you should bring your own equipment, like umbrellas or sea chairs with you. 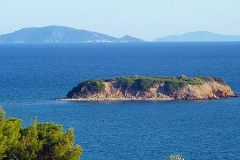 Many archeologists support that the area of Castri cape was the location of the ancient city of Galipsos that is referred in Herodotus. It is certain that there was an ancient settlement in the area. 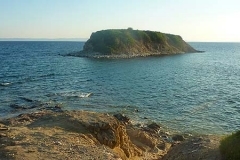 There are remains of fortifications on the island while there is an ancient cemetery discovered close to Ai Yiannis beach. 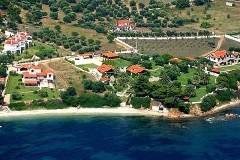 There is a narrow road leading to the beach that crosses the villas which block the way to the sea. To find it, follow the old road form Nikiti to Ai Yiannis. The road lead to one of the two bays of the beach. 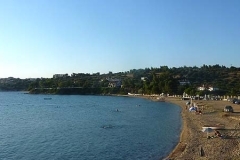 If you want to visit the other bay, prefer to go there by swimming because access with the car is very difficult. You may visit the rocky island in Castri cape even on foot, provided that you will find the ancient path that is now below water. 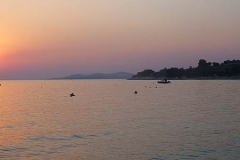 You should know that this is a family beach with no beach bars or sea sports facilities. In general, the beach is not well known. Nevertheless it is a small beach, so it likely that you will not find parking space some days in high season (from late July to mid August). Good. You may park your car along the beah road which is just a few meters from the sea. You should avoid coming in high season, so that you will find easier and more convenient parking. Note however that the beach is not organized, so there is no lifeguard or other facilities.